Take on any hard-to-reach or corroded hex nut that comes your way with the ABN Extra-Long SAE Standard Socket 7-Piece Set, 3/8" Inch Hex Drive - 1/8", 9/32", 3/16", 7/32", 1/4", 5/16", 3/8". These sockets are extra-long to get into narrow spaces and have chamfered ends that allow a snug fit on car, motorcycle, and other vehicle fasteners. The notched ends lock onto any 3/8" drive ratchet to prevent dropping or sticking in the fastener and are constructed from chrome vanadium steel for maximum torque (removable). 7 of the most popular sizes are included for wide use (1/8, 9/32, 3/16, 7/32, 1/4, 5/16, 3/8"). Storage is made easy with the included plastic carrying case. 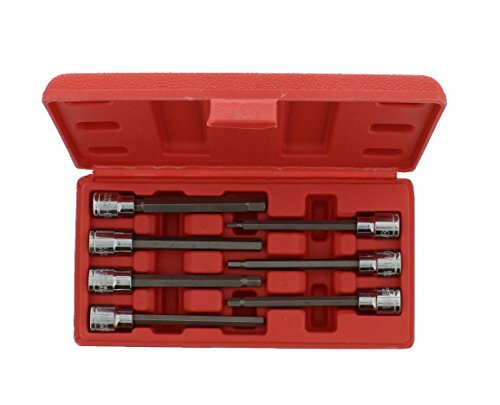 Don't get stuck on a stubborn fastener, add the ABN Extra-Long SAE Standard Socket 7-Piece Set to your toolbox.